This past week I had the joy of celebrating our Diocesan Feast Day in the Cathedral. December 8th marks the Solemnity of the Immaculate Conception. It is the “titular” of our Cathedral, and the patronal feast of both our Diocese and our country. Be assured that my Mass intentions and prayers were first and foremost for you all: that God would preserve us in unity and the integrity of the faith, and that we would become, more and more, a holy people, pleasing to the heavenly Father. Mary was redeemed by Christ – the one and only Redeemer – from the first moment of her life. God wanted to prepare for His Son a most worthy Mother. She remained, by reason of God’s grace and her own wondrous love, without any sin throughout her life. Mary is the most perfect example of a human being. She is a sign of what we are meant to be; a sign of what God’s grace can accomplish in a human person who fully cooperates with God’s goodness. This is God’s desire for us and there is no heavenly intercessor more ready to help us reach Jesus Christ than Mary. Like a good mother, she wants the very best for her children. The Immaculate Conception also represents God’s merciful will to give a new start to the human race after the fall of Adam and Eve, our first parents. Mary is called by many of the Fathers of the Church, the New Eve. What was lost by the sin of our first parents, is re-started, or given a second chance in Mary. She is “spes nostra,” our hope, because she shows us our true destiny – to be close to God all our life and for eternity in heaven. Two other feasts this week (one major and one minor) focus on this gift of our Mother and Queen: The Feast of Our Lady of Guadalupe, December 12, and the lesser memorial of our Lady of Loretto, December 10. The Blessed Mother, in her appearance at Guadalupe, is a very special patron not only for many Hispanic peoples, but truly for us all. 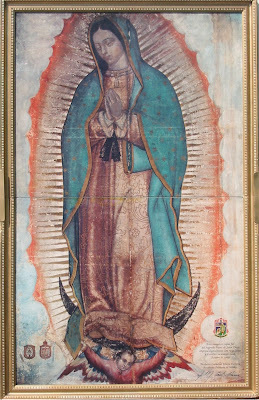 Her appearance to Juan Diego at Tepeyac in 1531, became the supernatural impetus for conversion and an end to human sacrifice in the pagan culture of what is now Mexico. The Virgin of Guadalupe remains for us a powerful intercessor in our efforts to protect unborn human life, the destruction of which remains prevalent in our current culture. Pope John Paul II, at the turn of the Millennium, called Our Lady of Guadalupe, the “Star of the New Evangelization,” and he asked Mary under this title to guide us toward a new Christian Springtime of Faith. In Loretto, Italy, is preserved the little house of the Holy Family from Nazareth. It is for us an image and reminder of the sanctity of the family at the center of all human society. We ask our Lady of Loretto to protect spouses and families, but also to protect the integrity and unique place of marriage and family in our culture. As the family goes, so goes our world. We must ask Mary and St. Joseph to help us realize better each day how important family life is to us all. Mary did everything God asked of her to prepare a safe path for Jesus. These Advent Marian commemorations can help us prepare our hearts, our homes, our Diocese, our country and world, to reserve for Christ His rightful place as Sovereign Lord, Redeemer, and King.